Cost: $150 (1 week) or $275 (2 weeks) in addition to session tuition fee. If your child is a thrill-seeker, it’s easy for parents to wonder how to funnel that craving for adrenaline in a safe way. Whether you have your active little bodies in gymnastics or not, flying trapeze offers an incredibly fun, accessible, and safe way for everyone to learn how to fly. Looking for a truly jaw-dropping activity for your child to participate in during this summer’s camp season? You’ve found it. Each Summer, Kennolyn partners with Trapeze Arts to provide professional trapeze instruction for our adventurous campers. With a full-scale trapeze swing rig set up at our Resident Camp location, professional instructors teach campers to swing, hang upside down and even perform a “catch!” With three activity days during a one-week session, each individual gets plenty of time to have fun, learn new skills, and enjoy flying. Learning trapeze as part of a traditional summer camp experience is a truly unique opportunity. 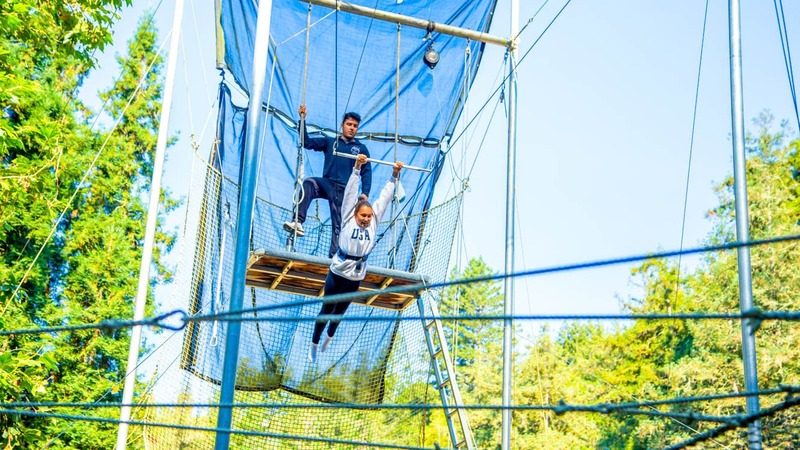 And because we believe wholeheartedly in the impact of a well-rounded summer camp, we schedule plenty of other exciting activities for all of our campers around their time on the trapeze bars. 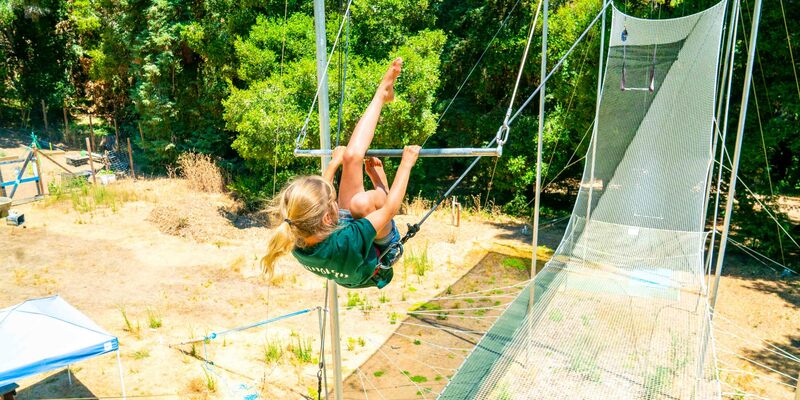 Not every California summer camp offers this level of variety and balance for campers who want to learn a specialty skill, and we’re proud to send each camper home with new friends, new skills, and plenty of stories from the trapeze rig as well as the campsite. Eager to get involved in this high-flying specialty activity? 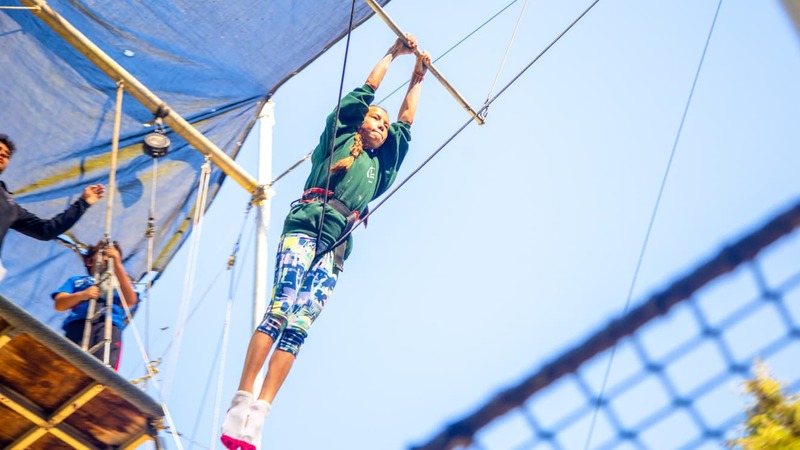 Kennolyn offers flying trapeze summer camps for both one and two-week stays throughout the entire summer session. Take a look at our Dates and Rates to figure out which camp session works best for your family. And if you’re ready to take flight, you can go ahead and register your brave camper for this specialty activity. Your child will soon be among the other Kennolyn campers swinging gracefully and fearlessly on the trapeze.